Well, after we made our big announcement, I was dying to find a way to document the journey. The main goal was to make or procure something physical that I could share with the baby as he/she got older. The goals were simple: digital files turned physical, creative, completely designed by me, and personal. I don’t do physical scrapbooking anymore. I would if I had the time. I now have a bunch of scraps and notes in folders tucked away in my craft closet. It’s been nearly three years since we got married and all my scraps are still neatly hidden (which is unfortunate). It was never made a priority on top of… life. But, I’m committing to documenting this maternity journey. They say there is nothing like your first one. This is how I’ll do mine. I am going to keep a notepad .txt file that will log each exciting occurence by week. My weeks start on Tuesdays. After the week is done, I’ll find an image or two that epitomizes one of those occurences and design a layout with a personal note addressed to the baby. Here we go! 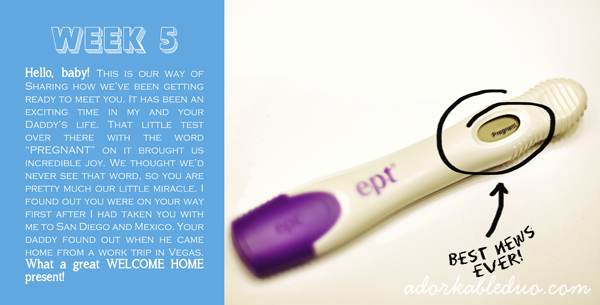 Week 5 was a long time ago, but it was the pivotal one in which I found out… after a year of trying… that I was pregnant! Did I ever mention we are both Type A? About 5,793 times? OK, well, we’re both Type A and when we decided it was the right time in our lives to have a kid, nature decided to test our adaptability by telling us we couldn’t have a kid… for a year. That Big, Fat Positive came on February 2 this year. I had a doctor’s appointment on January 9 to discuss next steps with my primary after a full year of trying. After sharing, the Dr. referred me to an infertility specialist. I made the appointment for the next month since I was going to be traveling a lot for work. I wrapped up my professional project during the month of January and noticed that my stress levels were significantly reduced. Boom, I got pregnant, cancelled the infertility appointment, and scheduled a confirmation appointment instead. Life is funny that way. I hope you follow me in my journey. I will tag these DIY maternity album posts with "maternity album".